Medicare Part B helps cover doctor's services, outpatient care, and some other services not covered by Part A. Part B is optional and has a monthly premium. This premium is deducted from your monthly Social Security check or billed quarterly if you're not yet receiving Social Security. When you first become eligible, by age, disability, or other criteria. This Initial Coverage Election Period (ICEP) lasts 7 months. During the annual General Enrollment Period for Medicare Parts A and B: January 1 through March 31 each year. Coverage starts July 1. If you don't enroll in Part B when you're first eligible for Medicare, and you decide to enroll later, your monthly Part B premium could go up 10 percent for each year that you could have had Part B but didn't enroll. If you have other coverage, such as employer-sponsored coverage, when you first become eligible for Medicare, you can defer your Medicare Part B enrollment to a later time without penalty — up to 8 months after your other coverage ends. Contact Social Security to find out more about deferring your Part B enrollment. If you are becoming eligible for Medicare and your employer offers a group retiree Medicare Advantage plan through Kaiser Permanente Washington, call us at 1-800-581-8252 or TTY WA Relay 711, from 8 a.m. to 5 p.m., Monday through Friday. When am I eligible for Medicare benefits and when do I need to enroll? Kaiser Permanente is an HMO plan with a Medicare contract. Enrollment in Kaiser Permanente depends on contract renewal. 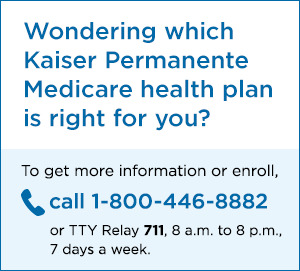 You must reside in the Kaiser Permanente Medicare health plan service area in which you enroll. For accommodations of persons with special needs at meetings, call 1-800-446-8882, TTY WA Relay 711. 1Every year, Medicare evaluates plans based on a 5-star rating system. 2Kaiser Foundation Health Plan of Washington. The National Committee for Quality Assurance (NCQA) is a private, 501(c)(3) not-for-profit organization dedicated to improving health care quality. It issues health insurance plan ratings and Quality Compass Health Plan Quality Measures for Commercial and Medicare plans each year.